Fake Plastic Tunes: Album Review: Edward Sharpe & The Magnetic Zeros -- "Here"
Album Review: Edward Sharpe & The Magnetic Zeros -- "Here"
The folklore behind Edward Sharpe is tall, if not monumental, and for exactly that reason I will decline discussion of it in this review. Not to say that I'm not somewhat of a sucker for it, but, just... not now. I will instead digress to the music. Here is Edward Sharpe & The Magnetic Zeros' attempt to follow up the group's debut album Up From Below, which received massive amounts of praise and recognition, with a few songs popping up in commercials, YouTube videos, and TV shows. But shoot... you probably already knew that. Up From Below is an incredibly difficult album to follow up. Not because it was incredible, per say, but there's just so much feeling behind it; the group has some very devoted fans, a group so devoted they would spend actual money on a small tambourine from the band's touring merchandise table. Despite it's seemingly nauseating rotation frequency, I never got entirely tired of any one song on Up From Below, as sappy as some of them are to me now. 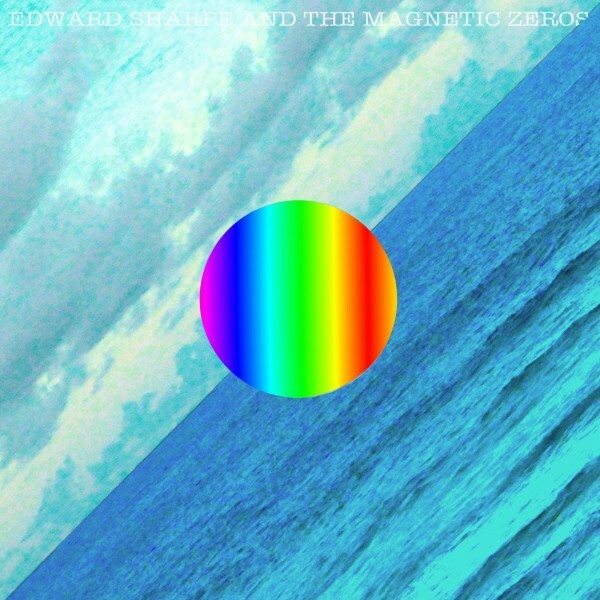 The feelings I have towards Edward Sharpe and The Magnetic Zeros' latest album, are very similar to the way I felt about MGMT's sophomore album, Congratulations: I can almost guarantee a lot of people will pan the album and label it a let-down, however, I think the sophomore album outshines the group's debut. Up From Below was so scattered with obscurities and oddities, blending a few pop hits within a wide spectrum of sounds, somehow only resulting in 13 songs. With Here, nine tracks in length, ESATMZ focuses on the more soul-centric elements of the same sound the group introduced in their previous effort. The pop songs are still there, ("Man On Fire") but the concept behind the album has changed, ever so slightly. The sound of music with this much enthusiasm is refreshing. As a group of people with a common goal, they found a type of music they wanted to focus on, and made an album centered around it; simple as that. In contrast to their previous album, Here is shorter in length, but the actual music itself is much more deep. The Magnetic Zeros do a wonderful job at combining the uniqueness of their instrument choices without sounding too much like an experiment (the use of didgiredoo in the album's lead single is daring, if not foolish) and Alex and Jade step aside to let some of the other band members give their best shot at vocals, "Child" is sung by the band's guitarist Christian. Not all of the songs are great, but the few that shine, are almost blinding. "Dear Believer" and "Man on Fire" are both spectacular songs, and "Fiya Wata" and "All Wash Out" are great closing tracks for the album. 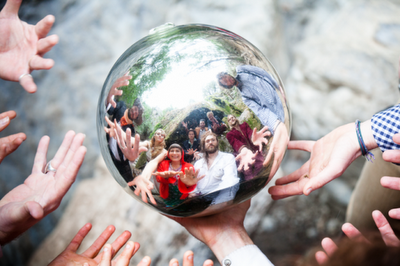 Edward Sharpe, et al. portray a very soulful inspiration with a vast majority of the album's songs; so much so that a few of them sound like they could be found being belted out in a Christian choir circle (possibly even a cult's). It takes a lot of guts to put out an album with as much religiously-centered lyrical content in a time when the group's listeners have been put through enough torture from acts with religous-forward motifs. However, most of the material seems to revolve around the pains of being a part of something larger than yourself; the difficulty with believing in something that may or may not be there. There are still moments of cheesy smiles, for instance the song "That's What's Up" (lyrics: "You be the book I'll be the binding/ You be the words I'll be the rhyming"), but none are nearly as gut-rotting as "Home". (I will also be the first to admit that I still enjoy that song) Although not all of the album catches the ear as well as other material, as a whole, Here is fantastically entertaining. The group was introduced with a great amount of foolish folklore behind it. But with Here, the album strips down the campy elements that were sporadically riddled in Up From Below and let's the music sing for itself.